What Zillow & Others Say About Their Own Automated Valuation Models Products? What Zillow & Others Say About Their Own AVM Products? 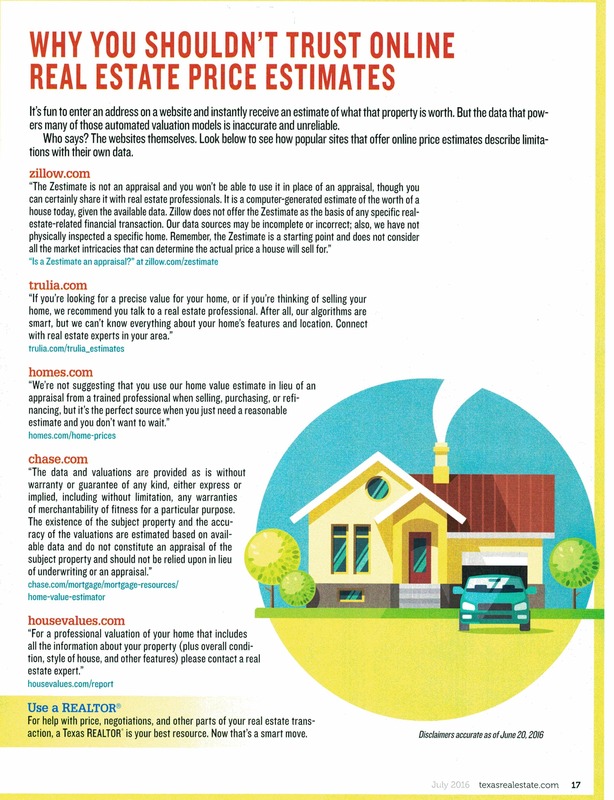 The July 2016 issue of Texas REALTOR magazine has an article about Automated Valuation Models or AVMs for short. The article included a graphic ( included below) with quotes from several of the noteworthy companies about lack of reliability in their own valuations. I don't think the article goes far enough to really explain the problem, at least in Texas. Texas is a nondisclosure state. This simply means that the sale price of a residential property is not disclosed to anyone, other than the parties to the transaction and included in the MLS. It's not shared with Zillow, the County Tax Assessor, For Sale By Owner dot com, or any other entity other than licensed REALTORS who belong to the local MLS. What this means is these AVM are mere guesses. The only way to accurately find out what a property is worth is to contact an appraiser or a knowledgeable local real estate professional and ask for a Broker's Price Opinion or a Comparative Market Analysis. These are the only people who have sufficient data to realistically & accurately value a property. If you want to know what your home is worth, contact Brian Rugg , broker at Rugg Realty LLC.